Jonas Akerlund's independent comedy will move into Blu-ray this February. 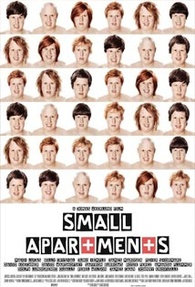 In an early announcement to retailers, Sony is working on 'Small Apartments' for Blu-ray on February 19. Trapped in a seedy LA apartment, Franklin Franklin (Matt Lucas) has a dead landlord on the kitchen floor and is surrounded by eccentric neighbors: the stoner (Johnny Knoxville) and girlfriend (Rebel Wilson), the wanna-be stripper (Juno Temple) and the artist (James Caan). To add to his chaos, a drunk investigator (Billy Crystal) is questioning him about his landlord. But none of this fazes Franklin. He dreams of Switzerland, and waits each day for an envelope from his institutionalized brother (James Marsden). Then, one day the envelope doesn't come and Franklin becomes unhinged. Little does he know...his crazy brother has the secret that will set him free. The Blu-ray will feature 1080p video, a DTS-HD Master Audio 5.1 soundtrack, and supplements include: How To Build A Gravity Bong and Small Apartments: Behind The Scenes. Suggested list price for the Blu-ray is still undetermined this time. You can find the latest specs for 'Small Apartments' linked from our Blu-ray Release Schedule, where it's indexed under February 19.